Who could possibly hate Hamlet? You might be annoyed with him for being such an indecisive wimp. But hate him? Only a TV star being pressured into the iconic role could have that kind of negative passion for the black-clad Dane. And so it is, in Paul Rudnick’s uproarious 1991 comedy, “I Hate Hamlet,” inspired by the comic writer’s stint in a Greenwich Village brownstone once inhabited (in the 1920s) by one of our country’s great Hamlets (and hams): John Barrymore. A scene from “I Hate Hamlet’ by the Intrepid Shakespeare Company. In the play, TV actor Andrew Rally moves into a place that’s so over-the-top he asks the realtor, “Is there a moat?” Needless to say, Barrymore slept there. The ditsy real estate lady (Gerilyn Grault, in wavering New York dialect) suggests a séance, to summon the Great Actor. Before long, he actually appears – but only to Andy at first – clad in tights and black velvet doublet: the eternal Hamlet (also eternally inebriated), returned to pass the torch to a fellow Hamlet. This is a play for, with and about actors. There were many in the house on opening night, and they howled. So, you might learn a lot about acting. And Hamlet. But in this Intrepid Shakespeare Company production, you’ll be so busy laughing you won’t even notice the incidental learning. 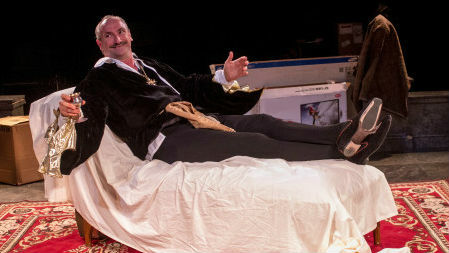 Christopher Williams, a master of farcical performance, directs with a light, deft touch. The timing is perfect, and the ensemble is a hoot. Brault is very funny as the realtor who sees herself as several notches below the “scum of the earth” that is an acting agent. Tom Stephenson is cast against type as the slick and slimy L.A. hustler, but he makes the guy’s comic lines about theater sing. Dagmar Fields and Brooke McCormick Paul have the ideal look and mien for their roles: the romantic, Teutonic agent and the reluctant not-yet-lover (an actress herself, an Ophelia wannabe). Francis Gercke handles Andy’s drama, comedy, physicality and indecision with aplomb (though he could lose that overblown carton-carrying at the outset). But this is Barrymore’s play, and Ruff Yeager totally nails it: larger than life, suave and sage, drunk, seductive and manipulative – but also surprisingly honest about his own flaws and downfalls — which were as numerous and notorious as his triumphs. With his imposing height and outrageous antics, Yaeger, like Barrymore, commands attention – and approbation. In the flexible black box space of San Dieguito Academy’s Performing Arts Centre, the audience, ensconced in lounge or beach chairs and loveseats, surrounds the action in Sean Yael-Cox’s excellent design. The costumes (Kristin McReddie) are attractive; the lighting (Curtis Mueller) and sound (Matt Lescault-Wood) are exemplary. Performances are Thursday-Saturday at 8 .pm. ; Saturday at 4 p.m., Sunday at 2 p.m. and 7 p.m.